These new anatomically-detailed images could improve the accuracy of future computer models of the heart and help us understand how normal and abnormal heart rhythms are generated. 3D imaging will give us a more thorough knowledge of the cardiac conduction system, and the way it changes in heart disease. Researchers hope that in particular, the technique will help them understand why the heart’s electrical system sometimes malfunctions, producing rhythms (such as fibrillation, or chaotic pumping) that are incompatible with life. Knowing how a normal heartbeat is generated — and knowing how that heartbeat becomes abnormal — may allow scientists to develop more effective means of preventing or treating heart problems associated with the heart’s electrical conduction system. The imaging technique was recently published in the journal PLoS ONE . Stephenson et al. 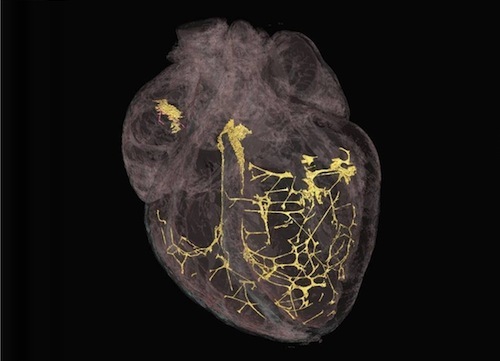 Contrast Enhanced Micro-Computed Tomography Resolves the 3-Dimensional Morphology of the Cardiac Conduction System in Mammalian Hearts. PLoS One. 2012;7(4):e35299. Epub 2012 Apr 11.